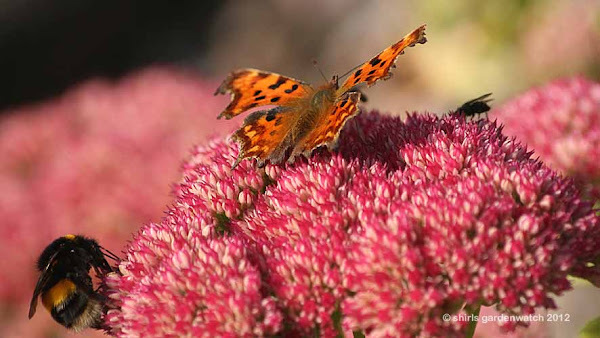 Spotted feeding on a Sedum a week ago, my cameras captured images and my books confirmed an ID to be the Comma Butterfly. I always love to see a new visitor to my garden. The interesting story on this species is that back in the 20th Century it was in serious decline and in recent years it has made a comeback. Further to this, the Comma Butterfly here in the UK, is expanding its range and has been heading Northwards from Southern Britain up through Scotland for a few years now. What’s interesting about that is that back in 1870 it was in fact extinct in Scotland. It has been suggested that climate change may be a factor in bringing it to the cooler temps up my way. The butterfly is moving north at between 12 and 15km a year, and in the last ten years has successfully colonised the Borders, all of the Lothians, Fife and the southern parts of Tayside, with recent sightings reported from Dundee and Pitlochry. Below you can see a short video captured on the sunny, Sunday evening of September the 23rd. I managed to get a nice close-up view which I was delighted about and I’ve added a longer view of this busy nectar bar at the end. Note there is gentle background music and you can choose an HD quality to view. 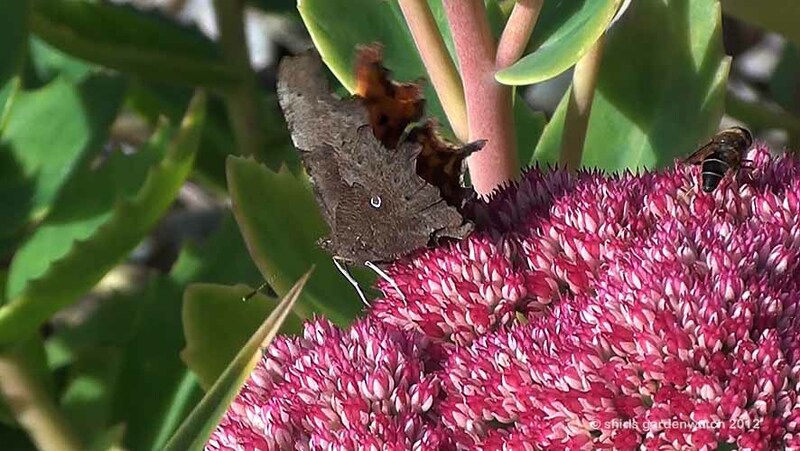 The image below it is a video grab showing the distinctive white mark shaped like a comma. Although the common nettle is the most widely used food plant for the Comma butterfly, here in my garden just over the fence from my popular sedum planting I have the golden hop Humulus lupulus which is another possible food plant. 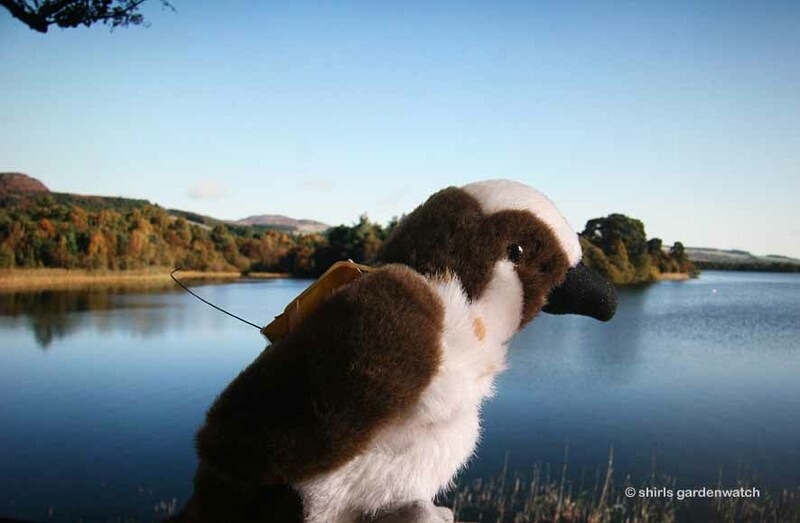 You were the first Osprey chick to be fitted with a satellite tracking device from the Osprey nest at SWT Loch of the Lowes in Perthshire, Scotland. Your stats tell us you left Lowes and began your Autumn migration at 10am on Saturday 9th September 2012. Oh Blue… so many people are wishing a safe journey to Africa for you. Remember it’s a long trip and you do have to take care during stormy weather... try not to get blown off course and get lost. Perhaps that thunder and lightning storm before you left gave you a taste of what you might encounter. Watch out for dangers like power lines and make sure you eat well before those desert crossings! Yep… we do worry about you eating enough. Our fingers are crossed tight hoping that you will have successfully mastered fishing before you leave the UK. We believe your master fisher Dad left Lowes on his migration the day before you. Perhaps you have seen him? 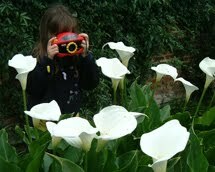 We have wondered if his inexperience as a parent has him still watching over you. Although… you did give us a bit of a scare when you fledged didn't you? 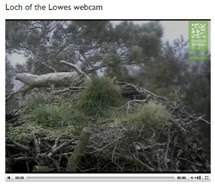 That maiden flight where you disappeared out of sight for four days worried lots of watchers at the Visitor Centre, on the webcam and blog. Fortunately that bit of technology on your back returned data after a few days telling everyone that you hadn't crashed landed completely and had been flying about. Phew there was relief all round! 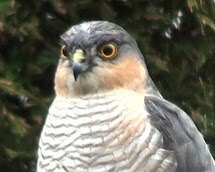 Oh but we were not amused… Mum appeared to be giving you one serious telling off when she escorted you back to the nest. Oh my… after all that shouting, we watched as she did a bit of dive bombing at you too. 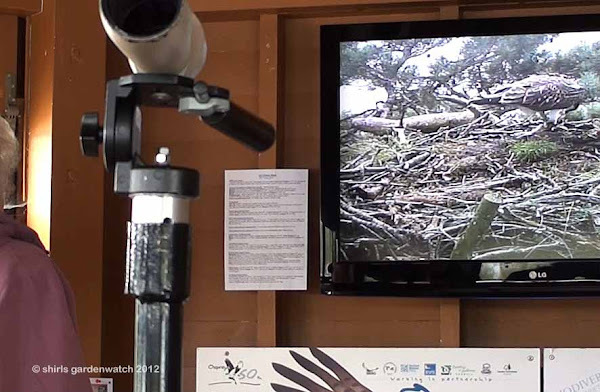 Forget the television soaps… we were all glued to the Osprey channel at Lowes. Lol… before we go any further I should acknowledge that the photo above isn’t a true likeness to yourself! No, not at all, but this bird fledged too and there's a story to tell before it completes its migration ;-) More on that later. Coming back to you, Blue… well weren’t you a very lucky lad? You have a famous and experienced Mum (known affectionately as Lady) who is believed to be one of the oldest breeding Ospreys in Europe. There have been many eyes watching you both and following your progress. Your Mum, Lady has been returning to the nest you hatched in for a staggering 22 consecutive years. Drum roll please… you were her 62nd egg and she had seen 48 Osprey chicks fledge before you! I’ll come back to tell her story in another post. 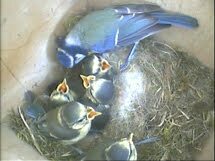 Since the end of March, Dad brought to your nest an Eel, a few Salmon, Blue and Rainbow Trout. He brought in a few more Perch and Mystery fish too. 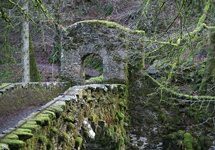 However he favoured fishing for Brown Trout and Pike which made up approximately two thirds of his catch which reached over 400 deliveries. You began feeding after May 21st, the day you hatched. You were a lucky lad indeed although it’s fair to say you begged a bit too much when Mum left on her Migration at a time when she must have felt you were ready for your fishing lessons from Dad. Mm… just what happened there? Was it Dad not giving you lessons or did you just not pay attention enough? Yes you are quite correct, I do remember hearing that you splashed into the water a few times… and yes and you did have the instinct to dry your feathers after… good boy. Although what happened to your instinct to hover above the water first to spot a fish before diving in? 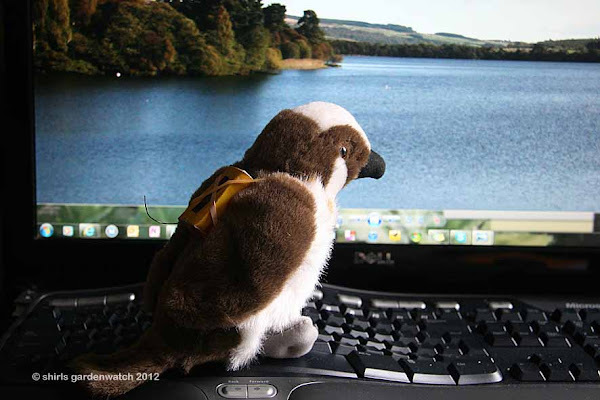 “The decision to satellite tag the osprey chick at Loch of the Lowes this year, has been taken following careful consideration and specialist advice from the UK’s foremost expert in this area, Roy Dennis, who will be carrying out the actual tagging process. It will enable us to gather important scientific data regarding the flight paths, stopping off points and final destinations of our own ospreys, and will be used in conjunction with other tagging work to build up a bigger picture of raptor migration to/from Scotland. With sufficient data it is hoped that the Scottish Wildlife Trust in conjunction with other conservation bodies also carrying out tagging projects, can in the future exert pressure on landowners and even governments to protect these stopping off points and destinations, which are very important to the life cycles of ospreys. It will also allow us to forge links with communities on our ospreys route, to further enhance their conservation. Satellite Tagging is a practice that has been undertaken very successfully by other conservation organisations and it is important that a high profile bird such as the chick at Lowes gives us the opportunity to highlight this very important scientific work. It is also the first time a bird from this part of Scotland(anywhere south of Speyside) has been done, which will give us insight into any local differences etc. 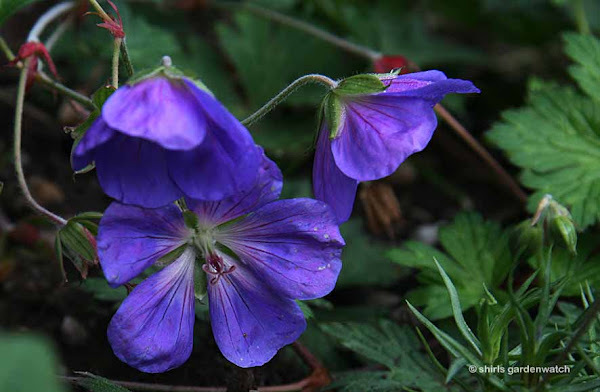 The project has been well supported by members and supporters of the Scottish Wildlife Trust, with over £11,000 raised in donations, over the last three years. We will do everything possible to minimise the risks, as the welfare of the osprey chick is of paramount importance to us- the whole process is designed to be quick and pain free and to minimise any stress. We hope to learn an enormous amount from this project, and help contribute to the conservation of the whole Osprey species. Thank you for all your feedback and questions about the project- rest assured we do take all your contributions into account. Having enough money raised to satellite tag two Osprey chicks and with you being an only chick at Lowes, the SWT made the decision to tag another Osprey chick from a nest at a nearby Angus Reserve. This chick was ringed with the name ‘BlueYD’ and is a male Osprey like you, only just a little younger. 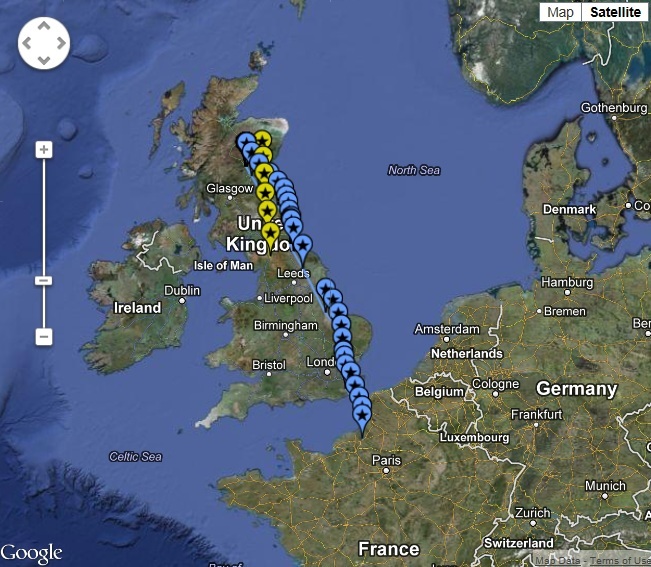 The fun will be to watch the migration routes you will both take in the coming weeks ahead. Oh... perhaps I should tell you that BlueYD left on his migration yesterday and he seems to be flying faster than you. Yes, Blue44... the race is on! Oh la la Blue… the stats from yesterday also say you've made your way across to France! Phew… we were worried about that English Channel crossing. That is great news and guess what... you've clocked up 500 miles in four days which is impressive when you never went went too far from your nest at Lowes. We are wondering if Mum's telling off kept you close by. So many people have been captivated by the story of your Mum, Lady. I was unaware of just how much she had touched the heart of my mother in law (MIL) until we were chatting earlier in the year. Being a SWT member and being able to drive my MIL to the visitor centre to see Lady has been fun. We have taken many trips, often going for a spot of lunch after. One of the early highlights (in the visitor centre, watching the live cam images) was seeing a huge salmon being delivered by your Dad to your Mum before you hatched. Oh... Blue44, the delight on my MIL’s face I will always remember. Delight and fascination grew as we watched you grow from being just two days old. Not having the internet, I have printed copies of the blog at Lowes for my MIL to follow your story. She was hooked! She was also quite upset when you went AWOL for those four days and described you as a little rascal when you returned with Mum. To mark the fun Osprey watching time we have had this summer, a fun gift was in order. I knew just the thing too – a singing soft toy Osprey! My MIL was always attracted to these singing soft toy birds in the shop area at Lowes although I had never spotted an Osprey at the centre. 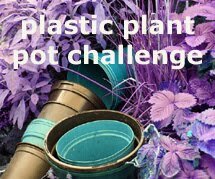 However, this fun idea was going to get even more fun! She’ll be in stitches when I tell her. I also visit the RSPB Loch Leven Reserve and spotting they had the same soft toy singing birds I asked if they had any Ospreys. They didn’t but suggested they might be able to get one from the RSPB Loch Garten Reserve shop. Lol… when we arrived at the shop to collect my Osprey gift the staff were chuckling. The staff at Loch Garten had played a joke with one of the birds by fitting it with a homemade satellite tracking device out of a small box, elastic bands etc. When I saw it my face lit up… could I have that one please? Since then, this soft toy Osprey has been resting up before it completes the final stage of its migration… to the home of my MIL. It should get there tomorrow sometime. She will be thrilled and emotional as every time she looks at this soft toy she will think of you, Blue44. To Lady, young Blue44 and to my MIL... thank-you for a summer of memories at Lowes. To Lady and Blue44 enjoy your time in Africa... Haste ye back! 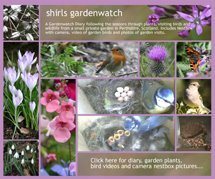 This post was written by Shirley for shirls gardenwatch in September 2012.